Since I was a kid, every World Cup would bring the same ads: If Spain wins, your TV is FREE! For decades, nobody ever won...until this victory. Now Toshiba is trying to weasel their way out of their get-your-money-back promotion. "Si la Roja gana, tú ganas" said the ad in big honking letters in magazines, newspapers, and TV commercials. If the Red—nickname for the Spanish soccer team—wins, you win. 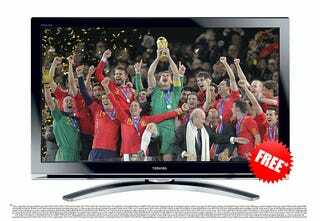 Buy a Toshiba laptop with the last Intel Core i5 2010 processor, or a Toshiba TV and, if Spain wins the final we will give all your money back. That was it. Pretty clear and straightforward... unless you read the small print, which was not available in any of the ads, only in the company's web site. There, the rules said that you had to register your product before June 17 to qualify. Of course, almost nobody did that, because the ads themselves didn't say anything about registration or any requirement. It was only: Buy our products and we will give your money back if Spain wins the final. As a result, Toshiba customers and consumer associations in Spain are up in arms against the company, demanding their money back exactly like the ads said, no registration required. The promotion sets the money back deadline to August 2, which is not in the ads either, but in the website small print rules.